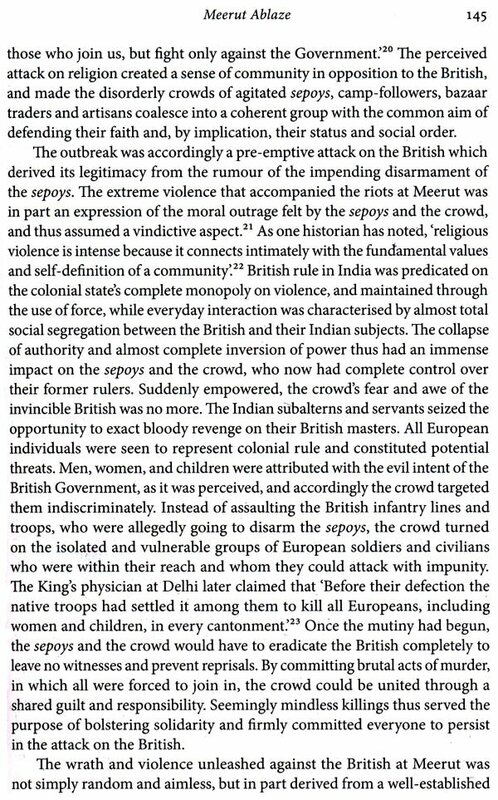 The Indian Uprising of 1857 had a profound impact on the colonial psyche, and its spectre haunted the British until the very last days of the Raj. For the past 150 years most aspects of the Uprising have been subjected to intense scrutiny by historians, yet the nature of the outbreak itself remains obscure. What was the extent of the conspiracies and plotting? 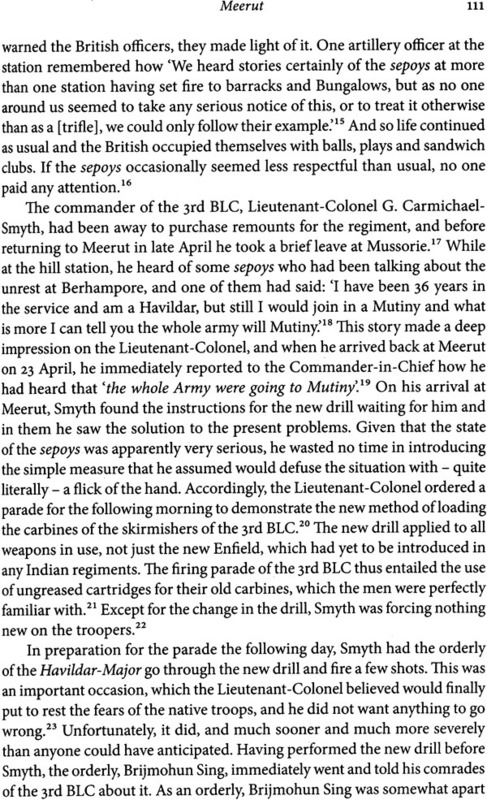 How could rumours of contaminated ammunition spark a mutiny when not a single greased cartridge was ever distributed to the sepoys? Based on a careful, even handed reassessment of the primary sources, The Great Fear of 1857 explores the existence of conspiracies during the early months of that year and presents a compelling and detailed narrative of the panics and rumours which moved Indians to take up arms. With its fresh and unsentimental approach, this book offers a radically new interpretation of one of the most controversial evnets in the history of British India. Kim A. Wagner is Lecturer in Imperial and World History at the University of Birmingham. He has published extensively on crime and rebellion in British India and his first book, Thuggee: Banditry and the British in Early Nineteenth-Century India, was shortlisted for the History Today Award 2008. 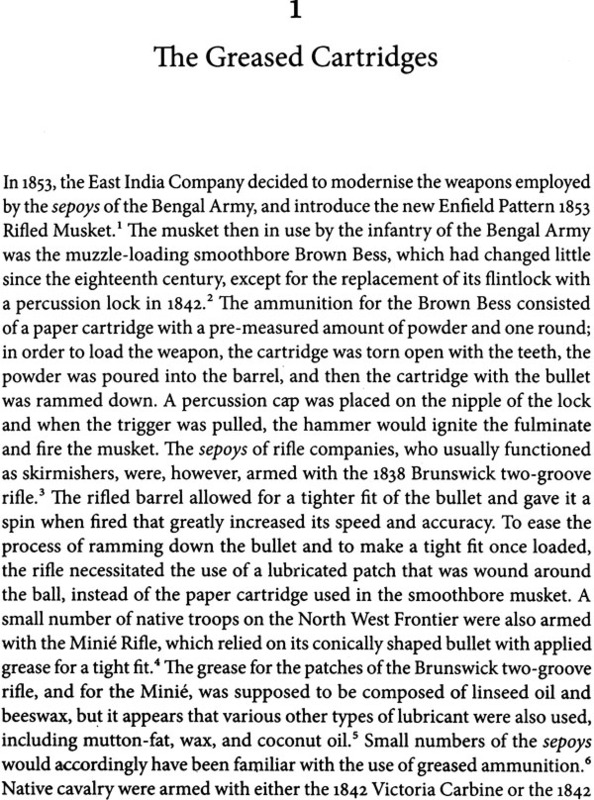 The introduction of the new Enfield rifle to the native regiments of the East India Company's army in 1857 was the immediate cause of the Uprising. 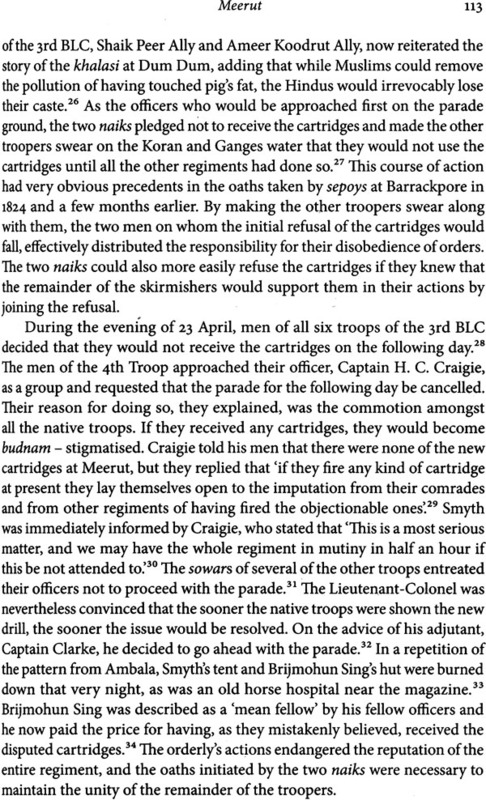 The cartridge for the new rifle was greased to ease the process of loading, and it was soon rumoured that the lubricant was composed of cow tallow and pig lard. 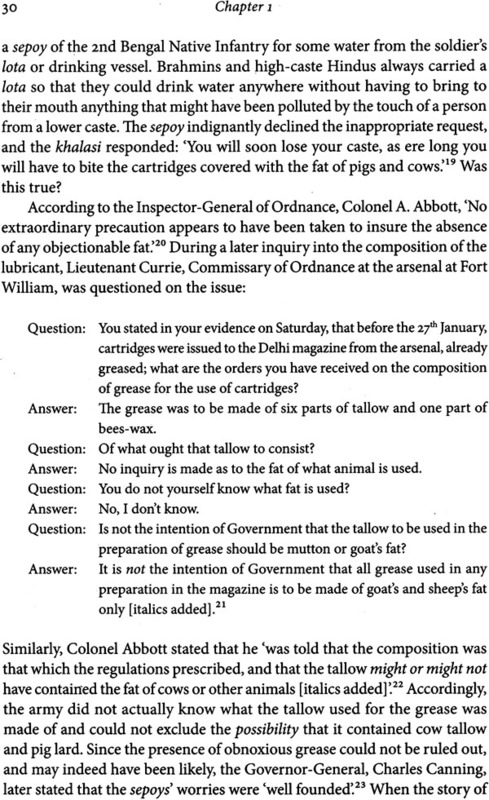 Since the drill required the cartridge to be torn open with the teeth, this would be ritually polluting and highly offensive to both Hindus and Muslims - the cow being sacred to the former, and the pig haram, or forbidden, to the latter. 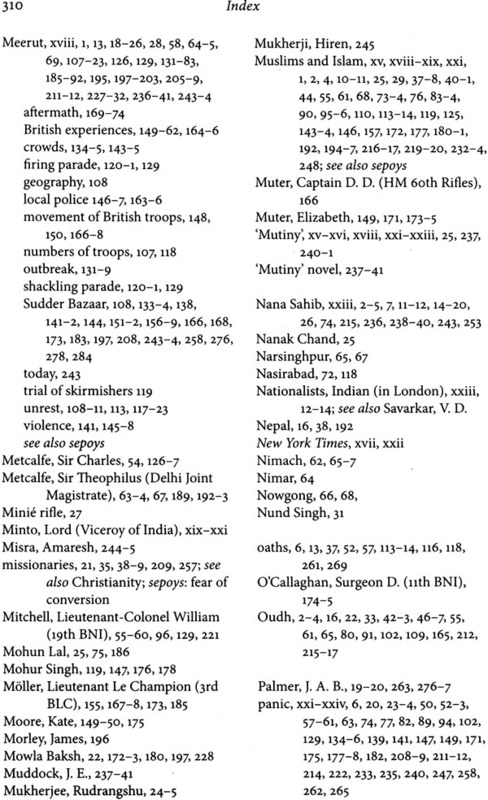 The Uprising broke out on 10 May 1857, when the sepoys at Meerut murdered their officers and all the British and Christian civilians that they came upon. The mutineers then proceeded to Delhi where the last Mughal Emperor, the enfeebled Bahadur Shah, was proclaimed king and the city became the symbolic centre of the uprising. 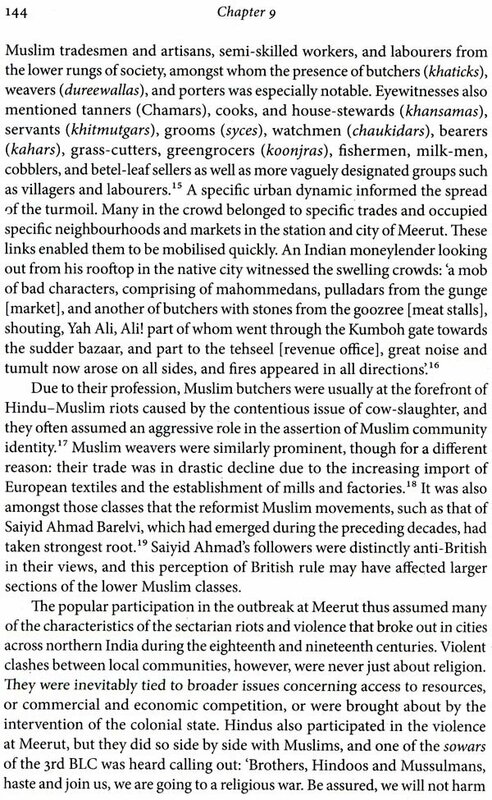 The unrest spread across northern India, and in many places the military mutiny assumed the character of a popular rebellion. Indian rulers, who had been dispossessed by the British, reclaimed their thrones, most notably at Delhi, Lucknow, and Cawnpore. With the assistance of British regiments diverted to India, and thousands of Indian troops who remained loyal, the Uprising was eventually suppressed, albeit with considerable losses on both sides, both military and civilian. The military campaigns lasted until 1859, when the last rebels were defeated and British authority was re-established. 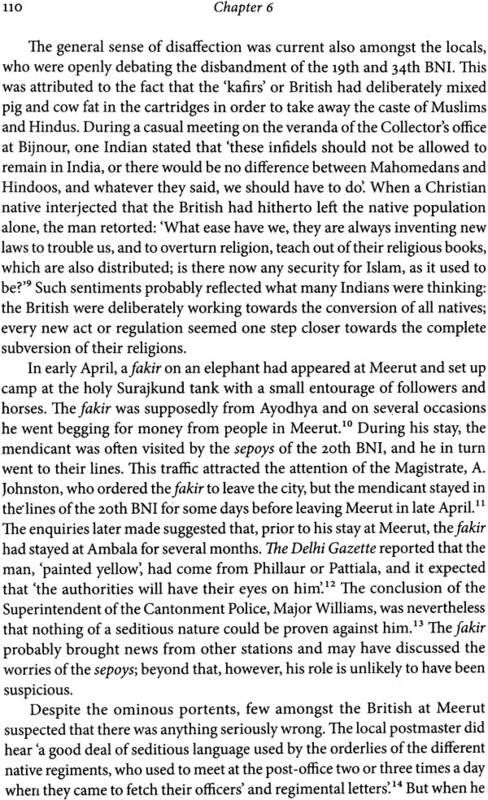 Thanks to the numerous accounts of the Uprising, including Evelyn Wood's heroic rehash, the reader of 1907 would have been in no doubt that it was the result of a conspiracy and, furthermore, that the ringleader was Nana Sahib, also known as Dandu Pant, the Peshwa of Bither.' Nana Sahib was the adopted son of the late Peshwa Baji Rao, a Mahratta ruler who had been exiled, but who managed to sustain a small kingdom thanks to the generous pension paid by the British. When the Peshwa died, Nana Sahib inherited his title and possessions, but the Government was not prepared to continue paying a pension and the new Peshwa faced the prospect of losing all his privileges. For years Nana Sahib petitioned the Government in order to have the pension resumed, and he even hired a British lawyer to present his case, but all to no avail. Nana Sahib's resentment of British rule was shared by many Indians who had been adversely affected by the expansion of the Company Raj. The kingdom of Oudh had been annexed in 1856 and the British sent the former king to Calcutta so they could keep an eye on him, along with his retinue. Similarly to Nana Sahib, the Rani of Jhansi had failed in getting her son acknowledged as the rightful heir when her husband died, and her state in the Bundelkhand region had 'lapsed' to the British. 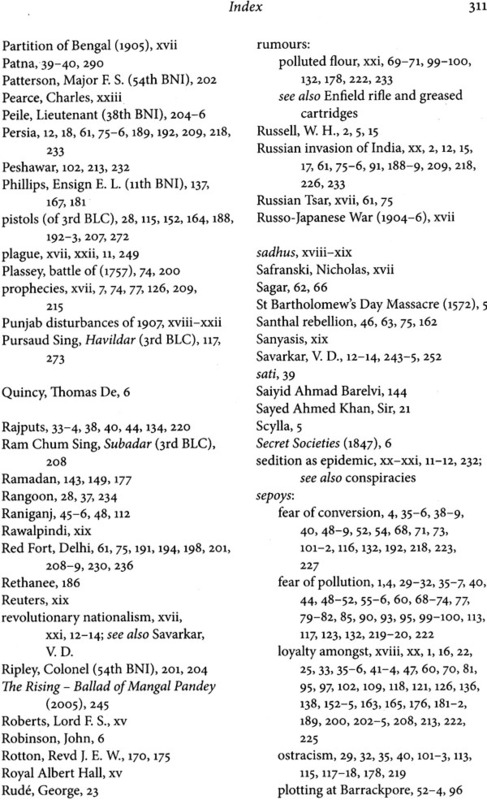 During the Uprising, Nana Sahib, the Rani, and a number of other dispossessed rulers emerged as important rebel leaders and their activities prior to the outbreak were suddenly regarded in a new light. What had seemed only mildly suspicious during the early months of 1857 now assumed a definitely sinister appearance. In 1854, Nana Sahib had dispatched a small delegation led by a Muslim retainer, Azimullah Khan, to London in a final attempt to salvage his income and obtain recognition of his official status. Azimullah did not succeed, and the failed mission was said to have deepened his dislike of the British, turning it into a profound hatred. On the way back to India, Azimullah and his companions went by way of Constantinople and the Crimea, where they met The Times' famous war correspondent, W. H. Russell, who was covering Britain's war with Russia. Russell later recalled how Azimullah had exhibited a suspicious interest in the recent British setbacks and the depleted state of their troops, and the journalist took an instant dislike to the man. A member of Azimullahs party, Mahommed Ali Khan, subsequently revealed that they had actually met with Russian agents at Constantinople and discussed the possibility of overthrowing British rule in India.' Back in India, Azimullah had supposedly lost no time in convincing his master that the only way to regain his former power was to turn against the Company. In the event, Nana Sahib needed no encouragement and one of his emissaries, Sitaram Bawa, later told the British that his master had been plotting their downfall for years. Nana Sahib had allegedly been sending out letters to all the independent Indian rulers to organise a rebellion, but it was only after the British annexed Oudh that his overtures met with any success. During the early months of 1857, Nana Sahib and Azimullah Khan were said to have toured northern India and visited Lucknow, Kalpi, and Delhi on what they claimed was a pilgrimage. 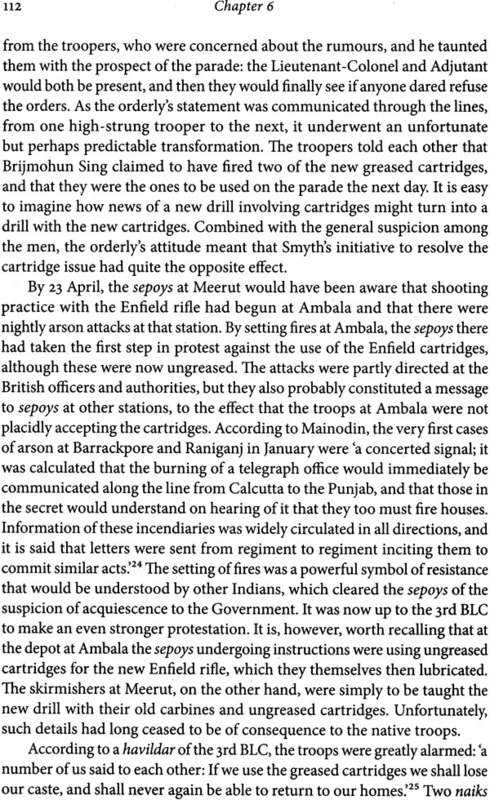 A British officer, who had met Azimullah on the boat back to India, was surprised to see him again at the military station at Ambala and later suggested that he had in fact been on a reconnaissance of all the stations where the Uprising was soon after to occur. Nana Sahib was also supposed to have met with agents of the deposed King of Oudh and the Mughal Emperor Bahadur Shah, who naturally shared his aspirations to rid India of the Company's rule. 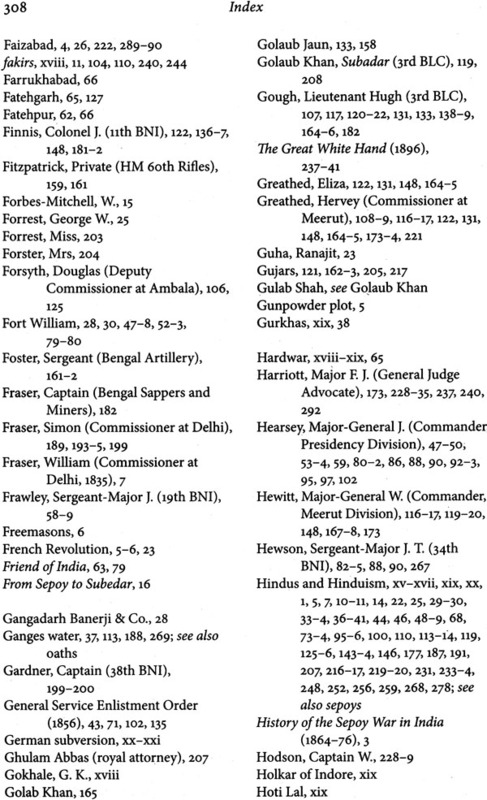 Combined with the fact that Nana Sahib later led the uprising against the British at Cawnpore, these accounts seemed to prove that he had indeed taken a leading part in a vast plot. 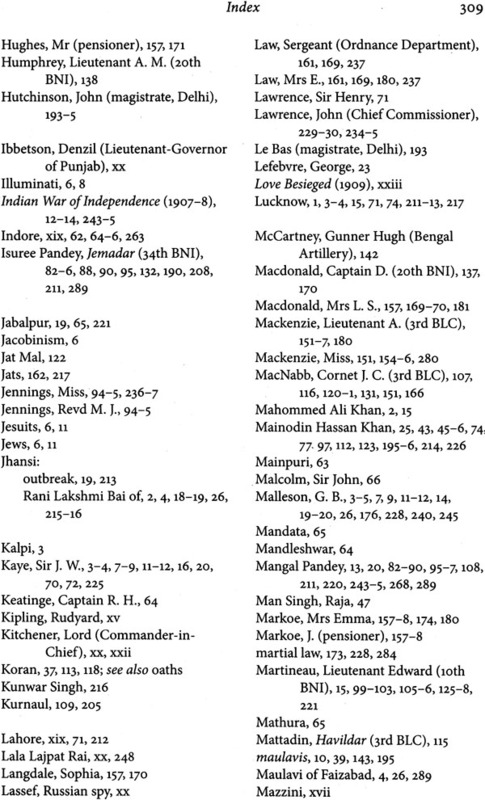 The official historian of 1857, J. w. Kaye, for one, was convinced and stated that 'there is nothing in my mind more clearly substantiated than the complicity of the Nana Sahib in wide-spread intrigues before the outbreak of the mutiny. 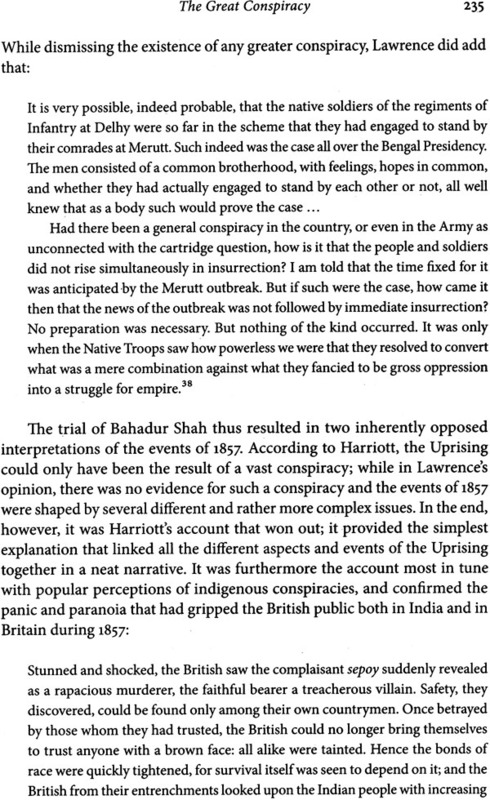 In Kayes magisterial account, History of the Sepoy War in India (1864-76), the existence of a conspiracy was not explicit, and the wording of the main text was rather careful when he discussed the unrest at Barrackpore in February and March of 1857: 'To what extent this idea of overpowering the Government had taken possession of the minds of the soldiery, and how far it was ever shaped into a definite scheme of action by those who were moved against us by religious or political animosities, can only be dimly conjectured," The circumspection, however, was belied in Kayes footnotes, where he easily identified the prime movers: 'In my mind there is no doubt of the activity, at this time, of the Oudh people at Garden Reach," In spite of the obvious uncertainties and inconclusive evidence, Kaye did not hesitate to point out the dispossessed native rulers and their retinue as the ringleaders - in his footnotes. If Kaye was somewhat cautious in his description of the plots, G. B. Malleson, who completed Kaye's work after the latter's death, showed no such timidity and is perhaps the strongest and most vocal proponent of the existence of a vast prearranged conspiracy Malleson acknowledged that the identity of all the conspirators might never be known, yet he was quite happy to give a detailed description of the conspiracy and the main plotters. 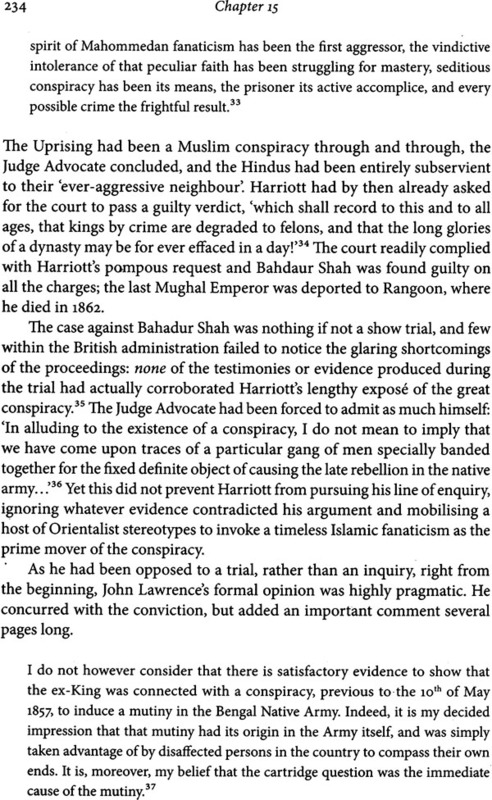 What Malleson described as the 'executive council' consisted of Nana Sahib, the Rani of Jhansi and the so-called Maulavi of Faizabad, a Muslim 'fanatic', who all worked in collaboration with the deposed rulers of Oudh. II According to Malleson, the sepoys were already discontented and 'ready to be practised upon by any schemer: while the annexations and revenue measures led to more general resentment against British rule amongst the Indian population: 'Conspirators to work upon so promising soil were not wanting to the occasion. That this man was the brain and the hand of the conspiracy there can, I think, be little doubt. During his travels he devised the scheme known as the chapati scheme. Chapatis are cakes of unleavened bread, the circulation of which from hand to hand is easy, and causes no suspicion. The great hope of the Maulavi was to work upon the minds, already prone to discontent, of the sipahis, When the means of influencing the armed men in the service of the British Government should have been so matured that, on a given signal, they would be prepared to rise simultaneously, the circulation of chapatis amongst the rural population of the North-west Provinces would notify them that a great rising would take place on the first favourable opportunity. 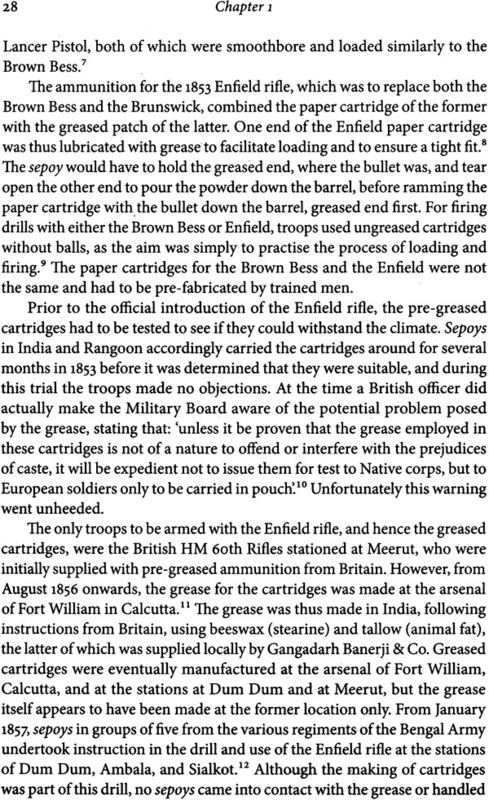 The introduction of the new Enfield cartridges provided the plotters with a heaven-sent opportunity to turn the sepoys against their masters. 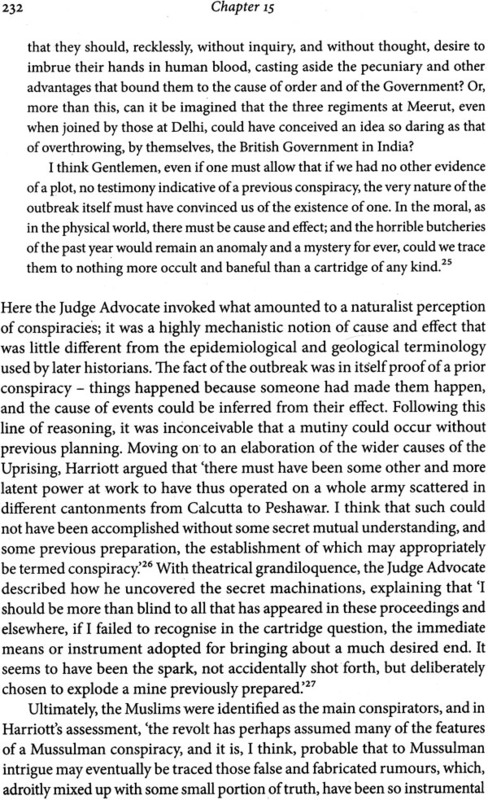 'It was so terrible a thing: according to Kaye, 'that, if the most malignant enemies of the British Government had sat in conclave for years, and brought an excess of devilish ingenuity to bear upon the invention of a scheme framed with the design of alarming the Sipahi mind from one end of India to the other, they could not have devised a lie better suited to the purpose. The British had not been adequately alert regarding the components of the grease, and the rumour of its obnoxious components was soon spread. 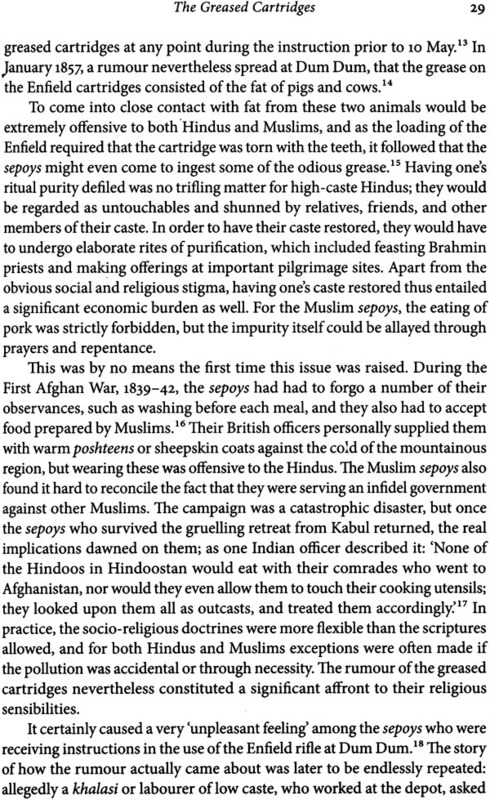 The sepoys were thus tricked into thinking that the Government had deliberately tried to pollute them: once they had lost their religion, they could more easily be converted to Christianity. 'The reader may ask how that was possible, considering that the cartridges were similar to those they had used for a century: Malleson explained. 'The answer is that fanaticism never reasons. The Hindus are fanatics for caste. The 'executive council' had skilfully manipulated the sepoys to rise against the British by exploiting their superstition and caste prejudices. 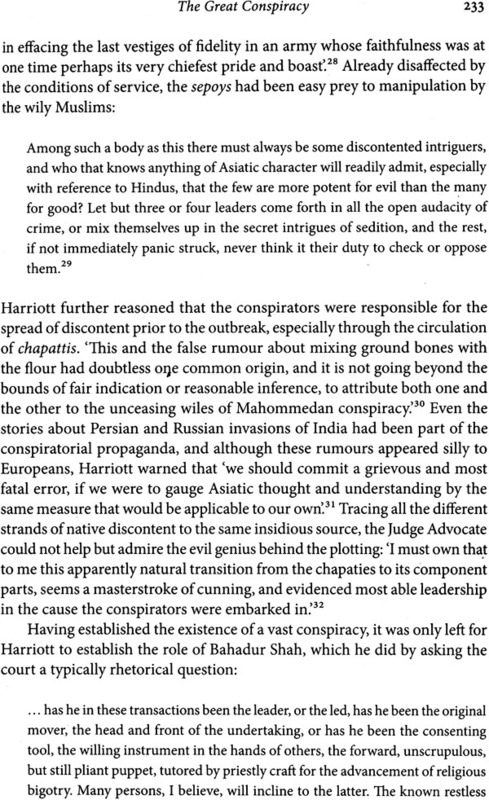 Malleson could reveal that what appeared as contingent events in 1857 were really something much more sinister: 'Indeed I may go as far as to declare that many of the actors in the drama failed to realise to their dying day that the outbreak was not merely a mutiny which they had to combat, but a vast conspiracy, the threads of which were widely spread.